With the crypto market’s recent instability and doubts as to its future and its impact on the existing Cryptocurrencies, we ask whether this technology ought to be put to better use than it is presently. On this subject we have made an exclusive, explorative interview with Daniel Surya, Chief Executive Officer of WIR, Asia’s leading group of companies focusing on Augmented Reality. With its headquarters in Indonesia, WIR is the technology company selected to showcase its technologies and to share various topics such as “WIR: Indonesia’s Next Unicorn in Digital Reality” at the Indonesia Pavilion during the World Economic Forum 2019 in Davos. Surya and his team have an alternative view on how to utilize blockchain technology. This is what we have explored during our meeting with Surya. The Outstanding Corporate Innovator Award from PDMA in Chicago in 2017. Surya explained that WIR have two business pillars: Branding and Technology. ‘DMID is our brand consulting firm that serves blue-chip brands and has won Rebrand 100 Global Awards for a number of years. For technology, we have three different units’. First is AR&Co, their AR developer firm that was considered as one of the first adopters of the technology in the region. Next is DAV. This offers intelligent media placement solutions in high-traffic places such as retails. ‘DAV has previously been deployed around 4,000 units nationwide, and now we will deploy 10,000 of its new generation device with new features such as transactions and Internet of Things together in collaboration with a listed company based in Shanghai, ESIM’. The third company is MINDSTORES, offering platforms to empower prosumers. ‘This means that now you can become a virtual store owner of a well-known brand with small investments, no inventory burdens, and no logistics hassle’. Currently with around 100,000 downloads, Mindstores has partnered with Alfamart, one of the biggest minimarket chains in Indonesia, Kimia Farma, one of the biggest pharmaceutical companies there, and Indihome by Telkom Indonesia as home cable provider. So, as a company, WIR and its digital reality offerings believes in real-world applications of the technology that can be used in today’s market mostly by engaging brands and corporations directly with consumers through digital reality interactions. ‘We’re also preparing ourselves to be more active and be game-changers in blockchain technology by launching an application, namely, MINAR’. WIR believes in the blockchain technology and sustains that their Augmented Reality (AR) technology can be utilized extensively in blockchain making their AR application the first AR application that uses this technology. WIR believes that 3 major factors make blockchain application effective: creativity, covering the fundamentals, and relevance. “Those 3 factors can be realized through a GAMING application and that can definitely be an advantage for brands too”. This is MINAR, a free-to-play, location-based mobile gaming application based on Augmented Reality (AR) technology and GPS feature. “With MINAR, you will discover a whole new world – a world filled with endless treasures. MINAR gives you the opportunity to explore real location and search far and wide to mine virtual treasures which can be found inside a Minar Stones in realtime”. MINAR has 3 kinds of virtual treasures as a form of a digital currency that has its own value and function: Minar Coins, Minar Points and Lucky Draw Tickets. The rarest with the highest value is the Minar Coin, followed by Minar Points and Lucky Draw Tickets as the most common. Mainly, Minar Coin and Minar Points are used to redeem various kinds of rewards which can be selected in our shop within the application. The main function of Lucky Draw Ticket is to give players the chance to win lucky draw prizes every time they play MINAR. MINAR is also a useful platform for businesses. It allows any organization to integrate its marketing campaign into the gaming platform which increases brand engagement by incentivizing its communication with the consumers through, for example, a reward system. Furthermore, MINAR will be able to collect an unprecedented user data through its unique user tracking analytics. This data asset will allow organizations to understand their users’ behavior, needs and wants, thus facilitating organizations in precisely tailoring their offer to consumers. MINAR has teamed up with Infinity Blockchain Ventures (IBV) to enable the game to tap into IBV’s technology and facilities. This can further boost MINAR’s potential to be more than just a gaming app, thus preparing MINAR to become a new breed of mobile application that disrupts the gaming industry globally. In order to introduce this game to the market, the WIR Group has done a soft-launch of MINAR during DISRUPTO 2018 in Jakarta last November and has officially given out monthly grand prizes to players who collect most points. 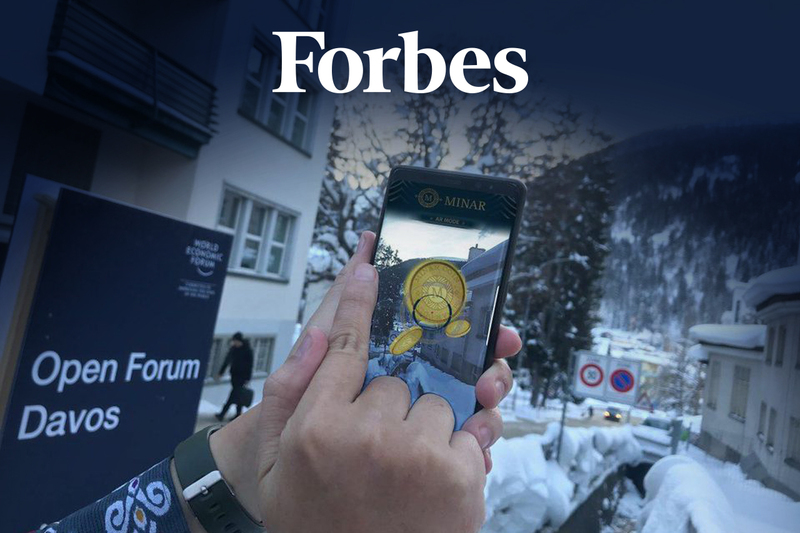 While, to kick off 2019 on a high note, here in the mountain town of Davos during the World Economic Forum, they are introducing MINAR to international delegations of business and government leaders, as well as international journalists by spreading 10,000 virtual coins all over the ski-resort town. “For this special “Davos edition”, our team gives out daily prizes for new players who come to see us at the Indonesia Pavilion’. ‘Also’, Surya announced, ‘In mid-February, WIR has been invited to introduce MINAR to the island country of Malta (part of the EU), as well as other Mediterranean nations. We will introduce MINAR through a keynote speech in the opening of the Mediterranean Tourism Forum, attended by government and business leaders from the tourism sector from countries such as Turkey, Italy, Morocco, Greece, Croatia, Egypt, Tunisia, Algiers, and many more. While working on the Mediterranean region, WIR will also work its way to introducing the game in East Asia, as well as the US and Europe”.